Maikel Nabil Sanad, 25, is entering his 42nd day of hunger strike, his ninth day of refusing water. 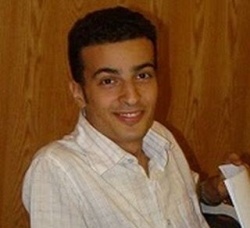 He was arrested on March 28 after publishing a blog post titled “The people and the army were never one hand.” Egypt’s Supreme Council of the Armed Forces accused him of “insulting the army.” A military court sentenced him to three years in prison. I’ve been trying to help Maikel get transferred to a hospital … It won’t cost the government any money. My son could die at any minute. Those who are close to Maikel assure us that his hunger strike is not a media stunt or a pressure tactic to facilitate his release from prison. To him, it is the principle that if the world is incapable of accepting the views of another human being, no matter how nonconforming these views are, then it is a world not worthy of being a part of. So what’s in the life of Maikel Nabil? The whole world is. It is either the world that Maikel is striving for or the world we already live in – made worse with the incarceration, and possibly death, of people like Maikel, and the thousands of political prisoners in Egypt of all sorts of political, religious, and cultural views. Let’s choose the world that Maikel is literally fighting with his life to earn. This entry was posted in Human Rights and tagged Egypt, Maikel Nabil, military trials, political prisoners, SCAF by scottlong1980. Bookmark the permalink.